The first 48 hours have been anything but dull! Apart from the intermittent electricity shortages plaguing Kathmandu there seems to be little or petrol available. I could only buy one litre to get me started & I very soon ran out on the way from the airport. While sitting on the side of the road contemplating whether to spend the night where I was, a passerby stopped & asked what I was doing. Of course when I told him he said it was too dangerous and to follow him to his hotel. Grateful & too tired to argue we pushed the bike for about two kms. He gave me a special deal on the price of a room as I was such “an old man”. I never managed to find the hotel I was booked into unfortunately and next morning amidst horrendous city traffic the clutch seized. 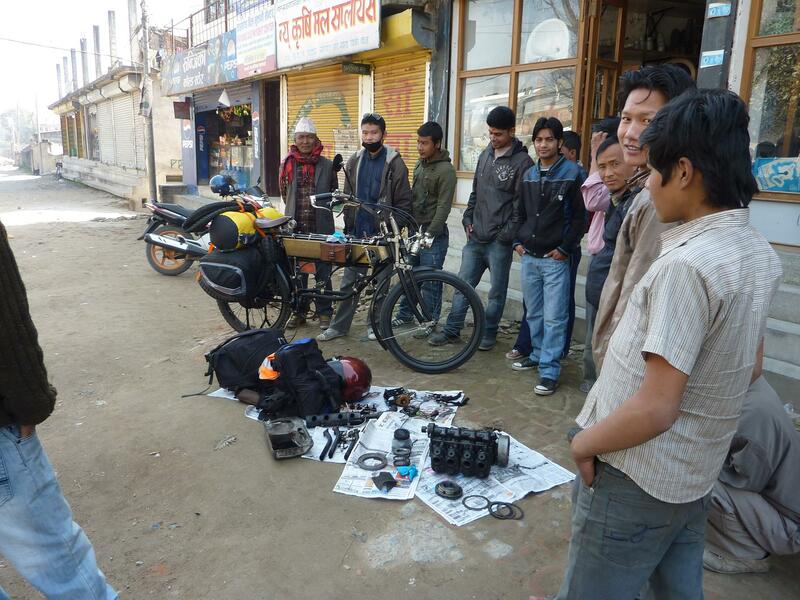 With the help of two great Nepalese guys who incidentally refused payment, I had it back on the road. Finally found my way out of the mayhem & headed towards Pokhara. The late start coupled with several badly broken sections meant I wasn’t going to make it to my destination in one day. A particularly steep descent took me half and hour to make it to the bottom. I can imagine how many hours it would take to get to the top – guess I have that to look forward to sometime over the next few days! I passed two buses which had collided head-on obviously trying to use the same side of the road, but given I was focused on keeping upright while balancing a spare can of fuel I figured a Kodak moment was out of the question. I finally made it to a hotel strangely named the Pokhara Inn even though I there was still 130kms to go to my destination! The manager spoke great English & made me very welcome. I’m knackered but after a chat on skype to Lynne I can chalk this up as a tough ride but the FN did a fantastic job. My first impressions – people curious, friendly and helpful. The traffic is much like Bali, but worse! It’s preparing me for India though I get a tad nervous remembering what others motorcyclists have said about Nepal being a piece of cake compared to India. Ah well, one challenge at a time. hi ron———hard to believe you are doing this trip and that we are able to follow it all on the computor——-obviously an unbelieveable adventure———-lots of people following your every move and praying for a succesful trip and for your safe return——-i’ll talk to the bloke up above but don’t know if it will help——-might though.—-i have two more motors on offer now——–a 1909 with clutch flywheel and a 1910 with early flywheel——–i’m just trying to achieve a result like yours but could never equal yours———–kind regards——hope it all gets easier and we lok forward to your succesful trip and safe return. cheers! Not sure prayers are what’s needed on these roads, but great to know you’re enjoying the blog. India is manic but people are fantastic. Amazing you’re finding all those motors – good luck with the restoration, you’ll get there. I have always admired you, and now even more. Well done you have a dream coming true! We send love and encouragement. I can’t imagine you skinnier or your poor BUM! OUCH! do you want me to send you a pair of padded pants? Thanks for all the good wishes – they’re much appreciated. Some padded pants would be great! LOL Lynne’s looking after me when we meet up and I’ve managed to fatten up a little on butter chicken. I tried to leave a message via this method a couple of weeks ago, not sure if it was successful, hope you have a wonderful trip! Hi Steve old mate – great to hear from you. Never got your earlier message unfortunately. India is overwhelming, people great, traffic unbelievable but it all seems to work. Bike is doing fine with constant maintenance. Journey sure is memorable. Hope you’re enjoying the blog. Looking forward to reading all about your adventure Ron. You are livin your dream – well done. Thanks Tania and Simon for your support & encouragement. It’s great to know you’re along for the ride. I’m getting skinnier by the day, but hoping a few days rest in Agra with home cooking will do the trick. Enjoy the blog! I’ve gasped already…!!! Seeing that photo of the FN in pieces in Kathmandu took my breath away. Then I smirked, smiled, then laughed. Nothing like having trouble right from the outset! And glad it’s not us for a change! But you do know our VERY BEST wishes are with you ALL the way and we will be regularly checking for updates to see how you’re progressing. Take very good care. Stay safe and enjoy the ride. I know you will. We will be travelling with you all the way. Finally have a warm bed & hot shower. I’ve got bruises on my bum the seat has gone so hard. I need to get a cushion. Rolled into Agra today looking pretty rough and filthy. A few days rest is looking good. Lynne arrived this morning by train, so good to see her, as it seems I’ve been on the road for months. India is much as we both expected and even though our last trip was so long ago it has helped keep things in perspective and not much is a surprise. Keep watching this space and thanks for your support, good wishes and prayers where ever they come from. Have lots of photos to upload over the next few days. Good to know you’re tuning in. Friends of your Bali family here,,, looking forward to reading your posts…. all our hats are off to you …. Thanks for the encouragement. Some days have been rougher than others, but meeting great people every day and enjoying the experience. Enjoy the ride! Great to see you & bike arrived intact, Ron. Bad luck about the clutch, but that is all part of the journey no doubt. As each busted thing gets fixed, so the FN should become increasingly reliable and robust. That road looked AMAZING! Only hope you were going down it and not up!! It would be a helluva push & pedal otherwise! With all the wonderful deeds and kindnesses you have selflessly done for others over the whole course of your life Ron, your balance in the ‘bank account’ of life is certainly overflowing with very worthy deposits. So I rest assured knowing that on this life changing journey you will always be kept safe, protected and cared for by so many willing and able souls along the way. God Speed my friend, relax and enjoy the experience to the max. And if, at times, when it all just gets too much, just stop and have a cuppa tea and chill out. Thanks for your kind wishes. India is overwhelming in every respect. You love it and hate it all at the same time! Good to have Lynne here and enjoying sharing some of the journey with her. Enjoy the trip with me. So glad the bike arrived intact and that you are really on the road at last. May all people remain curious, friendly and helpful!